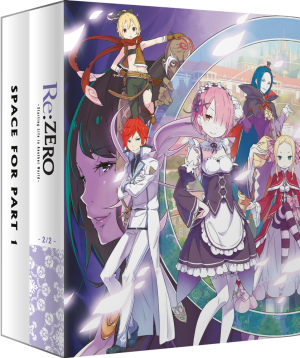 Re:ZERO Part 2 – Now available for pre-order!. Plus: An update on part 1 of the series. 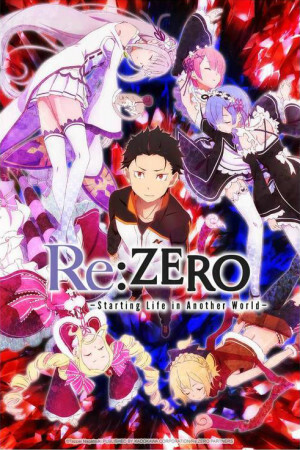 When it comes to titles that we know you’re excited about, our plans for the second half of Re:Zero -Starting Life in Another World- must surely top the list amongst the series we most often receive requests for information about. We know it’s been a long wait, but we’re sure it’ll be a worthwhile one as we can now give you the lowdown on exactly what to expect from our release of Re:Zero – Part 2… and what’s more, you can pre-order it right now! As you might expect, the series will be arriving in Collector’s Edition Blu-ray and Standard Edition DVD forms, with a release currently scheduled for 20th May 2019, but today we’re putting the focus on on the Blu-ray Ltd Collector’s Edition set specifically – in fact, today’s pre-order offer includes an exclusive bonus item that you simply won’t want to miss! Now, before we proceed with the details and links on where to order, in case you haven’t checked out the series yet here’s a quick refresher/introduction on what’s about. From the studio that brought you Goblin Slayer, Akame Ga Kill, Steins;Gate, Jormungand and The Devil is a Part-Timer! 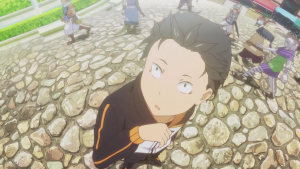 Synopsis: “Natsuki Subaru, an ordinary high school student, is on his way home from the convenience store when he finds himself transported to another world. As he’s lost and confused in a new world where he doesn’t even know left from right, the only person to reach out to him was a beautiful girl with silver hair. WHAT’S PLANNED FOR OUR RELEASE OF PART 2? Well first of you all you’ll be happy to hear that our Blu-ray Collector’s Edition for the second half of the series will very much be in keeping with the design style established with part one. It’ll come packed in a rigid case, with a Digipak to house the two Blu-ray discs (which for consistency alongside part 1 will be labeled respectively as discs 3 and 4). There will also be 52-page hardback art book that, as was the case with the book included with part 1, acts as a great companion to the series. The book covers numerous details about the show, its characters and more that occur or appear in episodes 12-25 specifically, matching the part one book which covered events from the first eleven episodes. Now, all of these words are great, but we know what you’re waiting for – you want to see how this set looks for yourself. So, without further ado, here’s your first look at what the Blu-ray Collector’s Edition For Re:Zero Part 2 will look like! Now, the eagle-eyed amongst you may have noticed another box in the top-left corner of the image above. “What’s that?” I hear you ponder. Well, we’re glad you asked – that’s a little bonus we’re delighted to be able to include; it’s an additional box to store both parts 1 and 2 of the series! This storage box will come with all copies of the Part 2 Blu-ray Ltd. Collector’s Edition set. However, this storage box is exclusive to Zavvi.com and AllTheAnime.com – it’s a limited edition extra limited to 1000 units, so once it’s out-of-print and out-of-stock across both sites there won’t be any more. The two Blu-ray discs contain Episodes 13-25 of the series with both English. and Japanese with English subtitles. Extras across the discs come in the form of Textless Opening and Closing title sequences, plus the complete set of Re:PETIT ~Re: Starting Life in Another World From PETIT~ shorts! 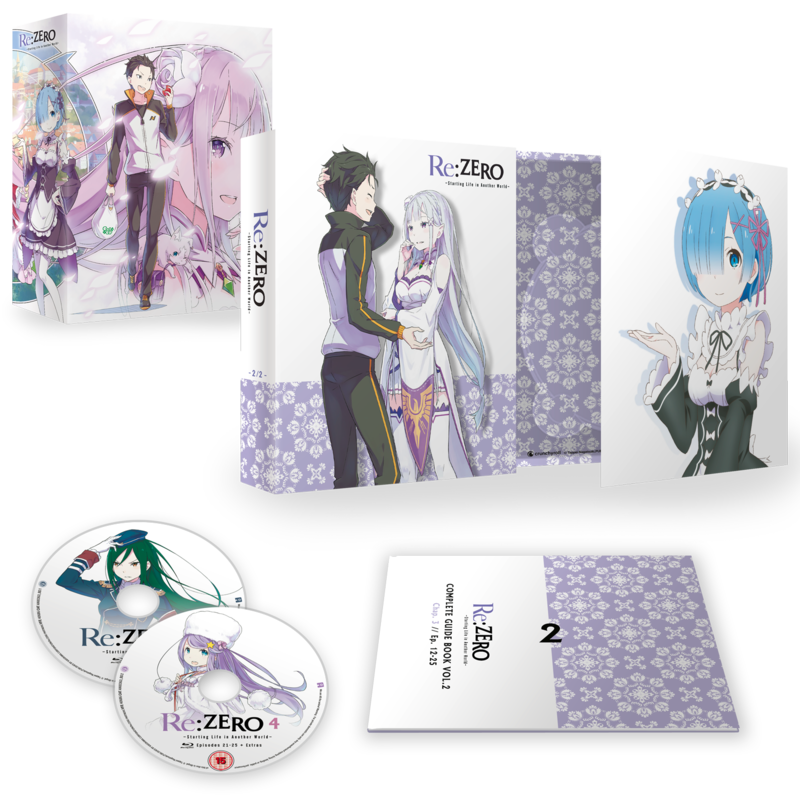 As we mentioned above, Re:Zero Part 2 arrives in the UK on Monday, 20th May, and you can pre-order this exclusive edition with bonus storage box right now from Zavvi.com and AllTheAnime.com. We’re sure you won’t want to miss out on the second half of this amazing series, so you can place your order right now using the links below. Away from all of these exciting Part 2 details for the moment, we also want to take a second to acknowledge that some of you who purchased the Blu-ray Collector’s Edition of Part 1 were unhappy with the video quality of the discs provided in this release. While we don’t have any precise details to share at this time on how or when this will happen, as we’re still in the process of finalising this, we do want to make it publicly known to anyone who purchased the Blu-ray Collector’s Edition set of Re:Zero Part 1 and was unhappy with their discs that we will replace them once a new set of disc masters with improved video quality are made available to us. We are currently waiting to receive these revised disc masters, so as I’m sure you’ll understand while we’re waiting for these new materials we don’t have any precise details to share at this time on how or when a replacement process can happen. Hopefully it won’t be too long for you to wait, but rest assured that it will happen as soon as possible. Until we have those materials and our plans finalised, we won’t have any more to say. We appreciate your patience and understanding on this. So there you have it folks! Re:Zero Part 2 finally arrives in the UK in May! We have no doubt that you’re looking forward to adding this to your collection, and we can’t wait to bring it to you, so pre-order today! Until next time, take care. Signing out~! Thank you guys for giving an update on Re:Zero. Ive the following question: I still didnt buy the first part collectors edition because I heard about the quality issues. 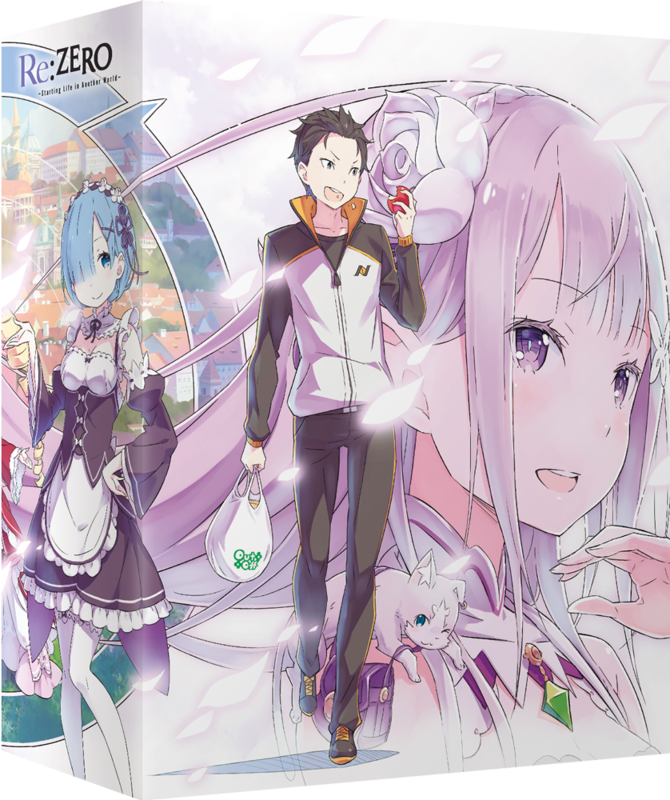 Once you have the new masters for part 1 will you make additonal Re:Zero collectors editions copies to sell or do ive the buy the current version and wait for the replacement program? WIll the replacement program also include the Netherlands or is it exclusively for the UK? I probably dont have to ask but does Part 2 have the improved disc masters? Will it be available on Amazon UK. It was the only way for us outside the UK to get it. It is great you are doing replacements, I was even willing to rebuy the standard Blu-ray of the first season if need be. Throwing up a pre-order now for season two cause I need that box and to finally have this series complete on my shelf.